Denny Hamlin and the FedEx Racing team endured a long day Sunday at Bristol Motor Speedway, as early contact disrupted the rear alignment of the #11 FedEx Toyota and resulted in a 33rd place finish. A group of cars just in front of Hamlin made contact on Lap 29, and Hamlin spun trying to avoid the wreck, but was hit from behind in the left-rear. What looked like cosmetic damage turned out to be much more severe, as it made the car a handful to drive for the remainder of the 500-lap event. With the finish, Hamlin dropped nine spots to 17th in the NASCAR Sprint Cup Series standings, 44 points behind leader Kurt Busch after four of 36 events. Hamlin is making his 11th career Cup Series start at Auto Club Speedway (ACS) on Sunday in the #11 FedEx Office Toyota Camry. In 10 previous trips to the two-mile speedway in Fontana, Calif., the 30-year-old driver has one top-five and four top-10 results, including a third-place finish in the fall 2008 event. This year marks the first since 2003 that the track is only hosting one Cup Series race. 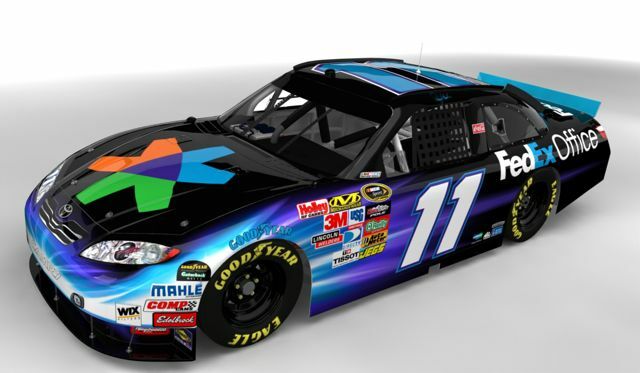 Hamlin finished 29th and eighth in the two events at ACS in 2010. Fuel strategy worked to near-perfection in the spring race last year, but two cut tires in the race’s final 30 laps resulted in the #11 Toyota finishing two laps down to the leaders. Hamlin rebounded in the fall trip to the track, as Hamlin charged from a 34th-place starting position to finish eighth and stay in the Chase hunt. Hamlin started on the pole in the fall 2009 race at Auto Club and was leading the field to the green flag on a lap 190 restart when contact with Juan Pablo Montoya sent Hamlin spinning through the infield grass to make contact with the pit wall. Hamlin has a pair of sixth-place runs at the track — in the fall of 2006 and spring of 2009. In total, Hamlin has led 56 laps with an average finish of 17.2 at Auto Club Speedway. The North Chicago and Wisconsin FedEx sales team with be recognized for their performance with the team’s center numbers “7376″ on the B-post of the #11 FedEx Office Toyota this weekend at Auto Club Speedway. The group is currently rated as the top sales team in FedEx’s annual President’s Club program. Does the new points system magnify a bad day? Do you enjoy racing at Auto Club Speedway?